Do you know what makes a Sales Qualified Lead (SQL)? If not, read on! A Sales Qualified Lead should not be confused with a Marketing Qualified Lead. That definition involves understanding the terminology, but also (maybe just as important) the indicators within your own process that alert you to potential customers moving down the funnel. If you know the terms (prospects, marketing qualified, sales qualified, etc. ), but don’t understand how your company determines and segments the leads within your sales process—you’ll end up losing potential clients. One of the most crucial terms to understand is the sales qualified lead (SQL). Without a clear series of events that alerts your marketing team and then the sales reps of when a lead is ready to be fit and then closed, you will be pitching leads that aren’t ready and losing those that were ready sooner. In short, it’s an important step. From here on out I’ll refer to a Sales Qualified Lead as an SQL. Essentially, this is someone who has come to you either by organic means or outreach and has expressed interest in your products to some degree. After they have expressed enough interest, they are shown to the sales team who then vets the lead further to gauge the lead’s sales readiness. Finally, the lead is cleared and enters into the next stage of the sales process. The overall process should look similar in any organization with both a sales and marketing team. Obviously, there is some difference between an MQL and an SQL. If one person does all the talking, it’s a lecture. You’re lecturing an audience to entice them to learn more about your product. Giving a grand image of a world that can be created with the things you sell. Marketing is more of a grand lecture and when your “students” begin to raise their hands—you begin to have a conversation. The biggest difference and indicator that your marketing leads may be sales-ready is their willingness and desire to turn your lecture into a conversation. Not that marketing doesn’t involve interaction. Social media, opt-in forms, email responses are all types of communication that can happen during the marketing phase. These are commonly known as engagement. It’s these things (among others) that help a team score the lead to gauge sales-readiness. The biggest difference between engagement within the marketing funnel and a lead looking for conversation is what/who they interact with. Again, this may differ from one company to another. Webinar Registration/Attendance: Depending on the content. If it’s geared more toward your target industry/audience, it may not move the leads to sales. Although, if it explains X ways your product improves Y—it could be close. Email Response: This is a much clearer indication of sales readiness. If you send a resource or other means of communication via email and the lead responds with some questions, they may be ready to have a fit call. Filling Out a Contact Form: Having ways for visitors to reach out on the site could be an easy way to pick out those who were further along in the process than you thought. Be ready, though. The faster the response, the more likely you are to land a conversation. Interesting: One study shows that you could be up to 100 times more likely to get a conversation with a lead, if you can respond within five minutes. Only 5% of companies strive to do so. If you notice, the definition lays out that both sales and marketing are involved before the lead is officially moved in status to an SQL. 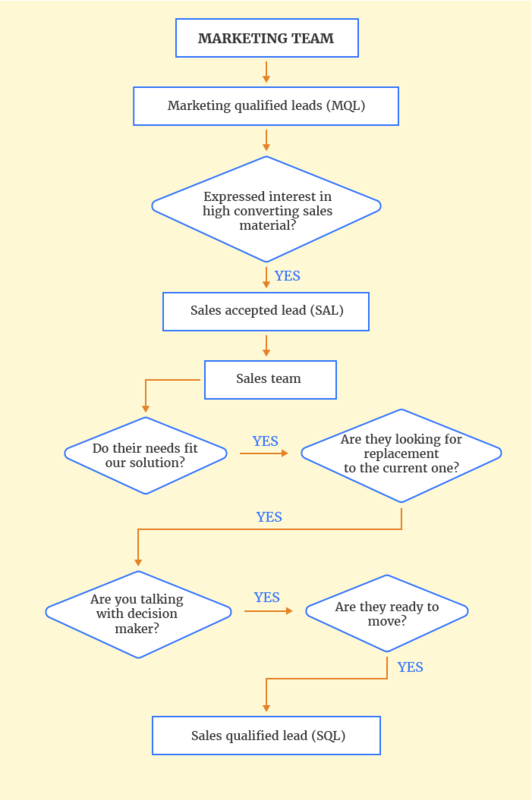 In many companies, this is it’s own separate step called a sales accepted lead (SAL). Here’s a quick breakdown of this typically speedy step. Then, a sales rep schedules (or it’s scheduled for them) a call with the lead to ask some further qualifying questions. So, we’ve moved from lecture, to engagement, to a conversation. In this call, you aren’t necessarily trying to pitch them. It’s more to learn if they are a fit for your products. You’re not trying to establish a secret club through exclusion, but you are trying to avoid clients that don’t need your products. Once the rep establishes that this is indeed a qualified lead for the sales team it’s an SQL. Meaning that they have not only accepted it, but will move forward with the sales process. Some of you reading this post either don’t have this step, do have screening/fit calls and don’t call it a separate step, or you may call what we call SAL’s SQL’s (or vice versa). We admit, it’s a bit sketchy. That’s why we’re looking to define some terms in our series. What Do We Ask Before Qualifying? A good rep may know when a lead is going to say yes or no before they do, but why ask a lead if they are ready to be sold? Depending on the size of your market and price of your product, talking before you sell can be a crucial step in the sales cycle. It helps you identify those who are ready for your process. Doing the work upfront means not having a problem client on your hands. In many industries (like SaaS and others), selling a client that will only pay you a month or two is like not selling them in the first place. Their Needs: How much will they be able to use your products to improve their current landscape. Current Solution: Who, what, and why are they using to currently fulfill the needs that you can. Also, find out why they are looking (if they are) for a replacement. Decision Maker: Is this person the honcho who will pay you, a researcher who is gleaning information, or an influencer who is looking to help? Ready to Move: Find out if the company is ready to switch solutions and that the budget is there for you to push them into the next step. Bonus Resource: Here’s a post/infographic from Salesforce that can help you identify your SQL’s just a little bit further. The Lead is Sales Qualified, Now What? You’ve kicked the tires, and so have your leads. What’s next? The best part about instituting a sales funnel process can be a “traditional” sales rep’s worst nightmare. If your company has recently moved to a process, reps could be used to being the marketing, sales, and customer service team all-in-one. When this occurs, your newly minted SQL’s could come to a rep that thinks the lead knows nothing. Repeating information and treating a lead as though they aren’t even slightly educated could be a big problem. When reps think that only those saying “yes” are making it through, they could get lazy and not fully close all that they could. Then, the sales team could get irritated with marketing for not sending better leads. Here are some tips to ensure that the maximum percentage of SQL’s go into the Closed-Won folder. Prep Work: Since the lead has been moving through a marketing funnel, you have an arsenal of intel on each lead. Look at the resources they’ve downloaded, the path they took through the marketing process, and even the engagement they had with those resources. If you look for insights, that intel will start to tell a story that you can work with on your call. Seek to Understand: When you’re ready for a demo, strategy session, or other name for the sales call it’s important to know that you’re trying to solve a problem. This is a different mindset than just selling a product. It’s a conversation, right? Talk with them, not at them. The lecture is over—now you’re looking for a long-term partner. Continue Their Story: A big mistake many make is to have this beautiful process of marketing and getting leads to abruptly end that communication with a short and sour final sales process. 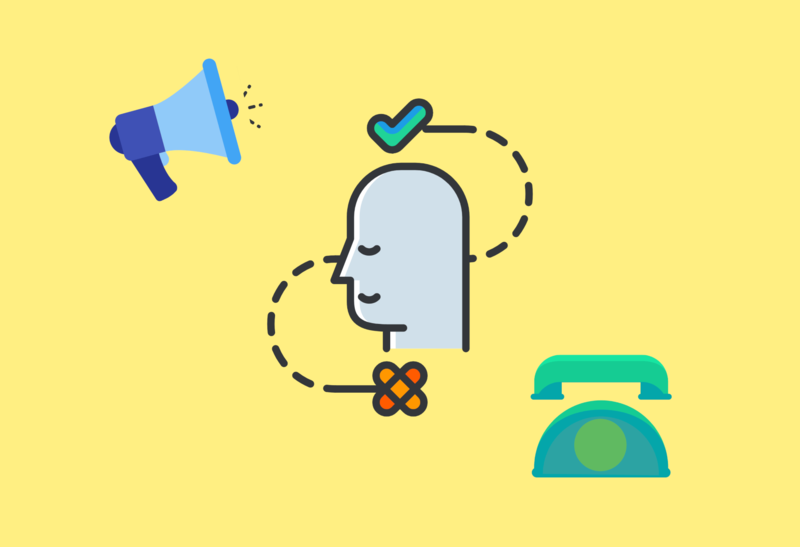 By making your sales call a continuation of the overall process, instead of the wall at the end of the tunnel, it could mean higher conversions. Ask them questions and finish their process (and yours, too). The key to having a great process is the ability to define the difference between MQL’s and SQL’s while handling the transfer from the marketing team to the sales team. You know you’re doing this well when the leads feel like they are walking along the process without any bumps and bruises. This will take building a great bridge between your teams. Communication between the two couldn’t be more important. If you have a lack of unity between sales and marketing, leads will slip through the cracks. The biggest crack in many organizations is the one between a Marketing Qualified Lead and a Sales Qualified Lead. How good is your team’s communication?